A Qatari endurance rider whose mount tested positive for the banned substance propoxyphene has been suspended from competing for two years and fined 1000 Swiss Francs. Ali Yousef J Y Al Kubaisi rode a horse named In Situ in the 120-kilometre two-star endurance competition at Mesaieed, in Doha, Qatar, on February 22. Manama, July 30 (BNA): Upon the directives of HM the King's Representative for Charity Works and Youth Affairs, the Supreme Council of Youth and Sports (SCYS)'s Chairman, Bahrain Olympic Committee (BOC)'s President and the leader of the Royal Endurance Team, HH Shaikh Nasser bin Hamad Al Khalifa, the Royal Endurance Team will participate in the 120-km Belgium International Endurance Race for adult and junior riders from all over the world on Saturday. The Royal Endurance Team's participation in Belgium Race will be the first of its type as the team has never been to Belgium before which constitutes a new challenge for the team especially in view of the difference in terrain and atmosphere in this European host country. His Highness affirmed huge confidence in the Royal Team riders and their expertise to achieve best results as they have already done in European races this season. Acronyms and abbreviations drive me crazy. We’re not talking Dance Around The Arena Naked kind of crazy, but if I ever developed a facial tick, I have no doubt that acronyms and their ilk would be to blame. To be strictly correct, I’m talking about abbreviations, contractions, acronyms and initialisms. Which makes me hate them even more. The barman has called for final drinks at the Last Chance Saloon, where the FEI and the United Arab Emirates have been holed up for four months trying to broker a deal over endurance. Early in March the pair had a very public showdown in the Main Street, after the FEI suspended the UAE over concerns around horse welfare and non-compliance with the world governing body’s rules. The UAE appealed and it was looking very much like pistols at dawn, as the two gun-toting parties squared off. Almost 11 months of preparation has brought me here – as you read this I’ll be in the air somewhere over Europe enroute to Beijing and then, after a 16-hour layover, on to Ulaanbaatar. It’s been another hectic week as I got back to Canada and immediately went about doing the boring Mongol Derby housekeeping stuff – paying my final entry fee installment, squaring away insurance and shopping for the final odds and ends I need (nothing says adventure like battling Toronto crowds as you shop for duct tape and Imodium). United Arab Emirates endurance riders are free to compete from Tuesday with the International Equestrian Federation (FEI’s) decision to lift their national federation’s unprecedented suspension. The FEI Bureau has unanimously approved the immediate reinstatement of the United Arab Emirates National Federation to full membership of the FEI following signature of a legally binding agreement between the two parties in which the Emirates Equestrian Federation (EEF) guarantees that horse welfare will be fully respected and that FEI Rules will be stringently enforced at all Endurance events, both national and international, in the country. The agreement has been signed by FEI President Ingmar De Vos and Secretary General Sabrina Zeender, and by EEF President HE Sheikh Dr Sultan Bin Khalifa Bin Zayed Al Nahyan and Secretary General Taleb Dhaher Al Mheiri, and Mohammad Al Kamali, Secretary General of the UAE National Olympic Committee. The EEF was provisionally suspended by the FEI Bureau in mid-March following an investigation by the FEI into major horse welfare issues and non-compliance with FEI Rules and Regulations in Endurance in the UAE. Following the suspension and at the request of the FEI Bureau, the EEF proposed an extensive list of actions it would undertake to address the issues. These were integrated into a draft agreement that the EEF sent to the FEI in early June. The FEI Bureau unanimously welcomed the proposals, but informed the EEF that more areas needed to be covered before the agreement that would allow the provisional suspension to be lifted could be signed. The two parties have spent the intervening weeks reviewing and revising the terms of the agreement. Rules for National Endurance events in the UAE are fully compliant with the FEI Rules and Regulations. The EEF will provide monthly written reports during the 2015/2016 season on steps taken to ensure ongoing compliance with FEI Rules and Regulations, and agrees to abide by any further recommendations put forward by the FEI. Following completion of the 2015/2016 season, the EEF will provide reports whenever requested by the FEI. Additionally, the EEF will support a research project to evaluate the causes of injuries linked to the design of desert endurance courses. Endurance Trainers will be obliged to cooperate with this research project. The agreement also details the new legislation that has been introduced in the UAE prohibiting the trade or use of banned substances in horse racing and equestrian sports in the country and the sanctions that will be imposed for breaches. Separately, the FEI had commissioned the Equestrian Community Integrity Unit (ECIU) to conduct an extensive inquiry into allegations of fake events and duplicate results in the UAE. These allegations were not taken into account when the FEI Bureau imposed the suspension, and were dealt with independently, but provisions have been included in the agreement to prevent similar occurrences in the future. The EEF cooperated fully with the inquiry and the detailed report has now been received by the FEI. The report is currently being reviewed by the FEI and a file will be submitted to the FEI Tribunal for further action. Sanctions will be taken against any FEI Officials found to be involved. In addition, the FEI will annul all duplicated results and review any connected results. At the same time, the EEF Endurance Committee conducted its own investigation into the allegations and has authorised sanctions on any Organisers and EEF staff that are found to be involved. The EEF is currently restructuring its organisational policies to ensure that similar events cannot occur again and will put rules in place for all future FEI events under which either the National Federation or the Organising Committee must provide all equipment, including the timing system. The EEF accepts that the FEI will be entitled to impose sanctions in case of non-compliance with all the terms of the agreement. These sanctions would include, but are not limited to, the immediate reinstatement of the suspension and withdrawal of the allocation of the 2016 FEI World Endurance Championships, which are due to be held in Dubai in mid-December next year. The agreement will remain in effect for a three-year period. During that time, the FEI and EEF will meet at least once a year for an in-depth review, in addition to the monthly written reports required under the agreement. The FEI reserves the right to extend the term of the agreement if appropriate. In this dog-eats-dog-then-campaigns-for-its-corner-office world, maybe we should be celebrating the wild ones, the carefree ones, the ones who value experience as much as stuff. World, meet Tucson’s Michelle Tanaka. Michelle Tanaka, meet world. Oh, you’ve already met. Michelle has seen the far reaches of the globe, traveled the Trans-Siberian Railway through Russia, planted trees in Australia, fended off creeping hands in dank, dark trains in India and slept under stars, a billion flickering lightbulbs in a black sky. And now, the 25-year-old will embark on her grandest adventure yet: the Mongol Derby. Between Aug. 5-15, she will trek 600 miles across the wooded plains and sandy dunes of the Mongolian steppe. Michelle will ride 25 semi-wild horses with long tails and thick manes that remain uncut. The arduous journey covers the sophisticated mail route that was created by the great Genghis Khan. Endurance GB has declined to comment on why a suspended UAE trainer was allowed to assist British riders at last week’s King’s Forest endurance international (12 July). The prominent Dubai-based trainer Anzaq Mehmood was seen using slosh bottles at crew points in photographs (not pictured above), which caused a storm on social media. DUBAI // A Dubai resident is going to be one of only 40 people who next month will take part in one of the world’s most gruelling events. 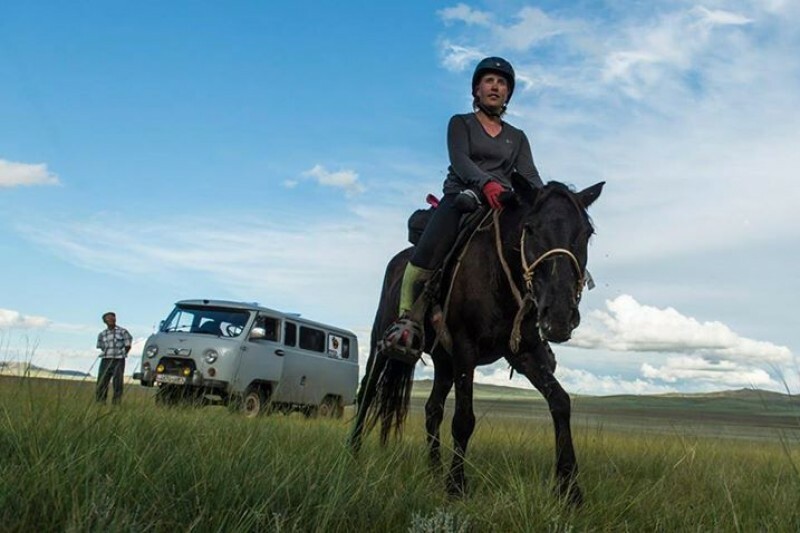 If not risking life, American University of Dubai finance graduate Uma Mencia will definitely be risking limb as she navigates 1000 kilometres of Mongolian wilderness with just her wits, her horse and possibly a GPS in the Mongol Derby. Started in 2009, the equestrian endurance test is modelled on the world’s first long-distance postal route established by Genghis Khan more than 700 years ago. Khan’s delivery system used a network of horse stations spread out through the vast Mongolian Steppe, and the Derby incorporates stops at 25 horse stations 40km apart. So it turns out the trek of the lifetime takes a little planning. Later this month, Tucson horsewoman Michelle Tanaka, 25, will take on the Mongol Derby, a brutal journey that traces the mail route of Genghis Khan. The longest of its kind in the world, the race will take her more than 600 miles over the Mongolian Steppe. The journey to get there might be even harder. The last two weeks have zoomed past and today I realize that in seven days I leave for Mongolia. It’s a bit surreal that my departure is so close now, having spent the last 11 months completely focused on this one goal. This past week I met another Derby rider – Michelle Tanaka – who drove nine hours from Arizona to come ride with me in Moab. On the first day of her stay, she got kitted out in her Derby gear (giant helmet visor, camelback, and photographer vest OVER the camelback) and hopped aboard a green broke Arabian named Ozi that Meryl and I have been training. Ozi was a bit freaked out, having never encountered a rider resembling the hunchback of Notre Dame and proceeded to scoot and canter laps in the round pen as Michelle tried to calm him.After only a few minutes she said she was ready to hit the trail. This girl is a lot braver than I, who bailed from Ozi just a week earlier when he did a big spook and bolt at a man in the neighbourhood who was pushing a bucket and pulling weeds from his driveway. Whether it's sky diving or spur-of-the-moment camps in the bush, Katikati man Ben Wilks has always been one to follow his sense of adventure. Now the 24-year-old plans, quite literally, to follow the tracks of Ghengis Khan in a ten-day, 1000km horse ride across the vast Mongolian steppe. Completing what is regarded as the world's longest and toughest horse race - and hopefully winning it - could prove the highlight of his life. Mr Wilks, a life-long rider who trains horses at a Tauranga racing stables, heard about the Mongol Derby from a friend from Northland who managed it two years ago. A look at some of the recent developments in the breeding of Pure Crabbet Arabians in New Zealand. The Crabbet Arabian in New Zealand has undergone somewhat of a resurgence in recent months, with four new pure Crabbets being brought into the country by existing breeders looking to consolidate these bloodlines in their breeding programmes. The FEI has urged caution over the use of an Argentinian equine muscle product called Fustex because it may contain propoxyphene, which is banned under the world governing body’s drug rules. Fustex is manufactured by Chinfield S.A. and is used in particular to stimulate muscle work. Equestrian Sports New Zealand (ESNZ) is looking to recruit and train Clean Sport Testing Officials to carry out the National and FEI Clean Sport Programme. As a Clean Sport Testing Official you will have exceptional organisational, coordination and communication skills. You will work alongside ESNZ National Office, Event Organising Committee members, Event Secretaries, Veterinarians, Riders and the person responsible for the horse/pony to ensure that Clean Sport is promoted positively and run efficiently and effectively during the event. You will also be able to think fast and be flexible when circumstances change. Adherence to the rules, confidentiality, fairness and integrity are core principles of ESNZ Clean Sport, you will also have a natural empathy when dealing with those being tested as the process can be daunting at times. Please note this volunteer role does attract remuneration of $50 per test plus travel. You will be required to hold full ESNZ membership. It wasn't in her plans, but Texan Devan Horn will return to Mongolia to contest the 7th renewal of the Mongol Derby on August 5-15. Billed as "the longest and toughest horse race in the world," it traverses the Mongolian Steppe, following part of Genghis Khan's 13th century relay postal system (think the US Pony Express on super steroids), with riders navigating by map and GPS, and changing horses every 40 km at Urtuus, or stations, eating and sleeping with locals in their gers, or eating and camping out in the open. The Mongolian ponies are billed as "semi-wild." Danger and hardships are guaranteed; so is an incredible experience of a lifetime. The Adventurists, who put on the Mongol Derby, put out a call only weeks earlier to veteran Mongol Derby riders, hoping to fill spots after several dropouts for this year's Derby. "After some hard thinking, some meditation, a couple of cocktails, and some of the most rigorous fitness testing I've ever put my body through, I've decided it's time to pick up the proverbial sword again," Horn said. It was the 2013 Mongol Derby, where Horn crossed the finish line first after riding a ‘near immaculate race’, but received a 2 hour penalty when her horse did not pulse down in the required time, which gave the victory to Britain Lara Prior-Palmer, second over the finish line an hour later. Despite the short notice, Devan is ready to have another go. "In 2013, I rode with all my heart and all my strength. This year, my heart and my strength are far greater, and I mean to ride as best I can." Mongol Derby participants are required to raise money for charity, and Horn's chosen charity is the Houston SPCA, a place near and dear to her heart. Over 20 riders from around the world (USA, United Kingdom, Spain, Switzerland, New Zealand, Australia, Austria, Sweden, Netherlands, France, Canada, Norway, South Africa) are expected to participate. Sunday 12th July saw riders from GB, Netherlands and Ireland compete in the international classes at Kings Forest, close to Bury St Edmunds, Suffolk. This was the second international ride there this year, organised by Dianne Luke. The CEI3* 160km winner, Nicola Thorne, riding L M 42 led the pack for the majority of the race and also took Best Condition. In second place was Annette Masterson, who represented GB at the 2014 World Equestrian Games, on Millenium Chorus and third went to Louise Rich on Oakleazefarm Cziko. Fourth went to Dutch rider, Donna Oudshoorn riding Sera. Donna rode at the 2012 World Endurance Championships at Euston Park for the Netherlands on her horse, Karrimh, who tragically fell and died shortly after in Newmarket. Donna made the trip over to England to compete her new horse Sera in his first 3* to commemorate Karrimh. In the 120km CEI2* the win went to Harry Ingram riding Warrens Hill Chayze, second to David Yeoman on Trop Vite Azureen, who also won Best Condition and third to Andrea Champ on Druimghigha Luxor. The 80km CEI1* winner Kathy Carr riding Aberllwyd Femme Fatalle won Best Condition. Second place went to Sharon Parr who was also riding a Warrens Hill horse, Warrens Hill Troy. Equine Canada and Endurance Canada are pleased to announce the two young athletes who will represent Canada at the 2015 Adequan/FEI North American Junior and Young Rider Championship (NAJYRC), set to take place July 14-19, 2015 at the Kentucky Horse Park in Lexington, KY.
Savanah Wilson of Kemptville, ON and Solstice Pecile of Bailieboro, ON, have been named to represent Canada in Endurance, which will be held on July 16, 2015. This is an FEI CEI 4*, 120 km ride. Wilson will be riding Hoover the Mover, Cheryl Van Deusen’s 11 year old gelding while Pecile’s partner is her current mount, Glorious Song IA, a 19-year old Arabian mare. The team will have support from veterinarian, Dr. Glenn Sinclair and Chef d’Équipe, Bob Gielen. For more information on NAJYRC 2015, visit www.youngriders.org. While training for the Mongol Derby I’ve continuously tried to find the balance between pushing myself and keeping my body intact so I arrive at the start line as healthy and fit as can be. All that went to hell last week as I had a minor accident that left me with an injury that’s going to hinder me in Mongolia and is making my training in Utah significantly more painful and difficult. On Wednesday, Christoph, Meryl (the French intern) and I trailered three horses to the mountains to do some altitude and incline training to get these horses ready for Tevis (a famous 100-mile endurance ride in the southwest U.S.). It was meant to be a fast 40 kilometre ride, snaking up a mountain and back down again. ERF is very grateful to Australian Vet and Endurance Rider, Anna Erickson, for allowing us to reproduce her comment on Endurance riding from her perspective. This is even more significant as news is filtering through from the Middle East that various UAE Endurance Stables are insisting that the FEI has lifted the ban. Which of course is entirely untrue. 2. What in the hell is going on in endurance? 3. Have you seen anything like this here? 4. How do people justify still selling horses to the UAE? The 27-month FEI suspension on a virtually unknown Qatari endurance rider Nasser Khalifa NJ Al Thani received a lot of media coverage recently. There is nothing new, of course, about an endurance rider from Group 7 (Middle East) being banned for doping, but the reason it is now News with a capital N is simple: the FEI has a new policy of issuing press releases about Tribunal decisions. To date, they have only issued statements about cases with an Olympic or World Equestrian Games connection – with the obvious exception of the Jock Paget case, the subject of media frenzy. This welcome initiative means those interested no longer have to consult the Tribunal database every other day, waiting for something new to pop up. In future, every media outlet will receive a ready-to-use story. If this spurs more colleagues to then read the much juicier, full decision notice I am all for it. The detailed evidence therein provides a snap-shot of the some very strange goings-on. Judges and officials at international shows and events are being encouraged to become “amateur policemen” in the fight against cheating, with the distribution of new “evidence-gathering guidelines” by the FEI. The FEI ramped up its fight against doping and rule-breaking with a review of legal procedures to close loopholes following the collapse last year of the Sheikh Hamdan/Marmoog horse swap enquiry on a legal technicality. In a further step, the guidelines emphasise the importance of officials minutely recording dates and times of witnessed incidents. Following the conclusion of the USEF Selection Trials for the U.S. Endurance Young Rider Team, the USEF has named the athlete/horse combinations to the Squad for the 2015 World Endurance Championship for Young Riders & Juniors. In order to remain in consideration for the U.S. Endurance Young Rider Team, the athlete/horse combinations are required to demonstrate continued preparation, soundness, and ability. Following the completion of any additional assessments, twelve athlete/horse combinations may be named to the FEI Nominated Entries for the Event. The 2015 FEI World Endurance Championship for Young Riders & Juniors is to be held October 23-25, 2015 in Santo Domingo, Chile.